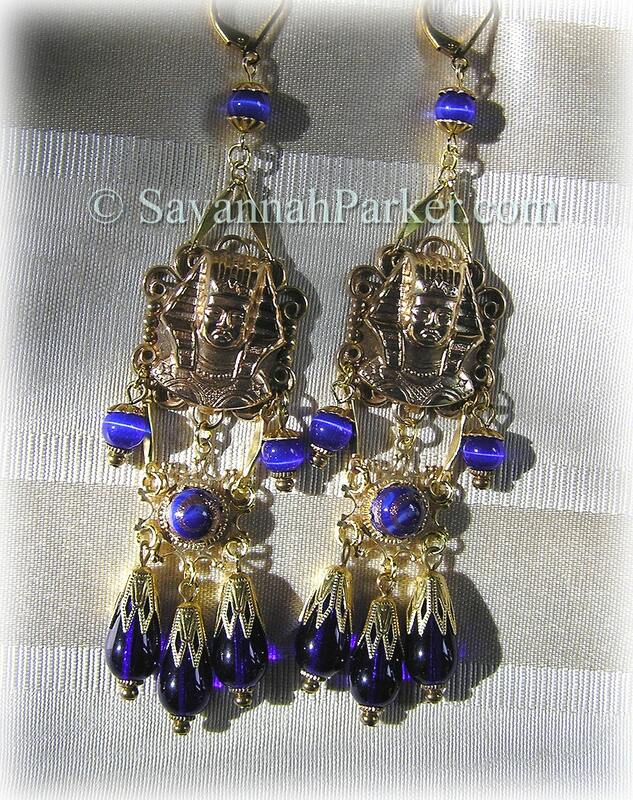 Antique Style 1920's Deco Egyptian Revival style GORGEOUS cobalt blue glass and vintage brass earrings, with marvelous detailed vintage brass Egyptian Pharaoh mountings---these are wonderfully wearable and showcase some of my finest vintage stones, beads and findings. 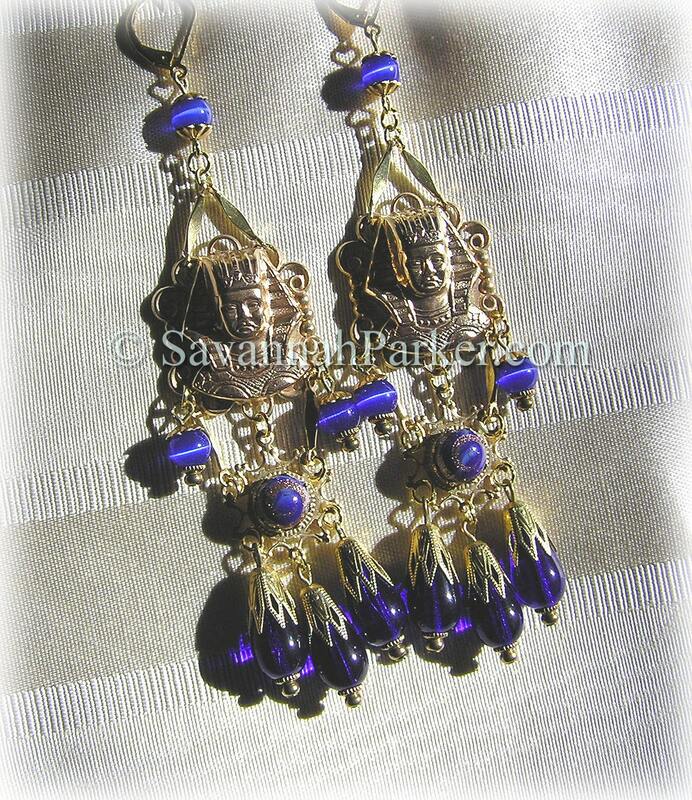 I designed and put together these beautiful and elaborate Egyptian 20's style earrings using mostly antique components (including some utterly fabulous vintage genuine old brass findings from the 20's!) and hand finished/burnished brass parts & filigree. With the discovery of King Tutanhkamen's tomb by Howard Carter in 1922, there followed a widespread craze for everything Egyptian, and it permeated all levels of style from fashion to furnishings during those years...putting a modern 1920s Deco spin on a beautiful ancient style and making it even more unique. PLEASE READ THE DESCRIPTION CAREFULLY before asking questions! All details about size, etc. are addressed here, so it's very important to READ all of this...thank you :-) Also please note that these are individually hand made to order, so there is a four to six week completion time BEFORE shipment; if this presents a problem for you please do not purchase. As a long-time antique clothing and jewelry collector, I'm inspired to create antique/vintage-style jewelry that has the superb old elements and rare vintage glass stones and beads I have gathered over the years....All of the pieces I do are individually hand made and incorporate as many of the antique elements as possible, plus durable yet authentic brass fittings that I have hand finished with that "aged" look. Most often my pieces are one of a kind, however I've found that when I have a small supply of vintage stones or elements, it's nice to be able to keep more than one person happy by creating very limited editions of three or four...that way more people have a chance at owning something they particularly love! 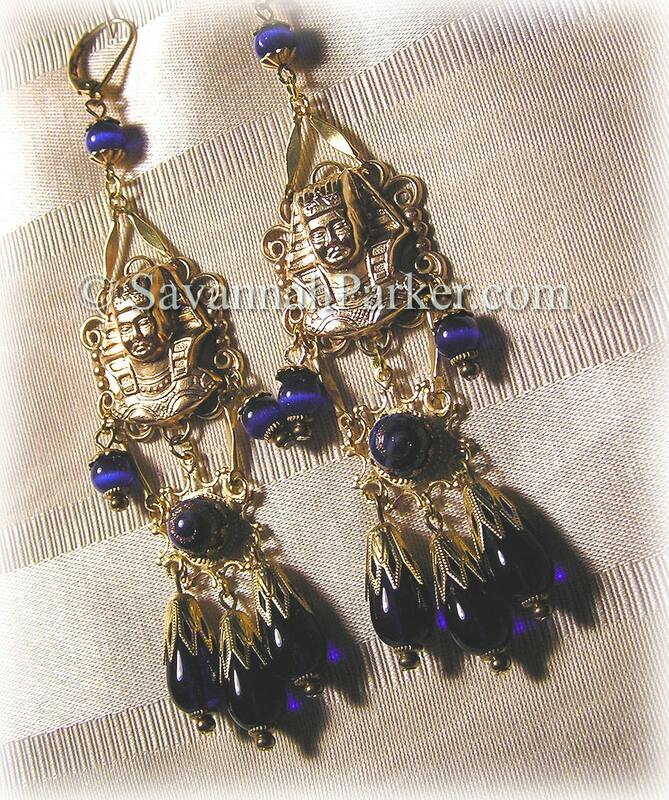 These earrings are very BOLD and for the true fashionista/diva as they are total attention grabbing pieces! 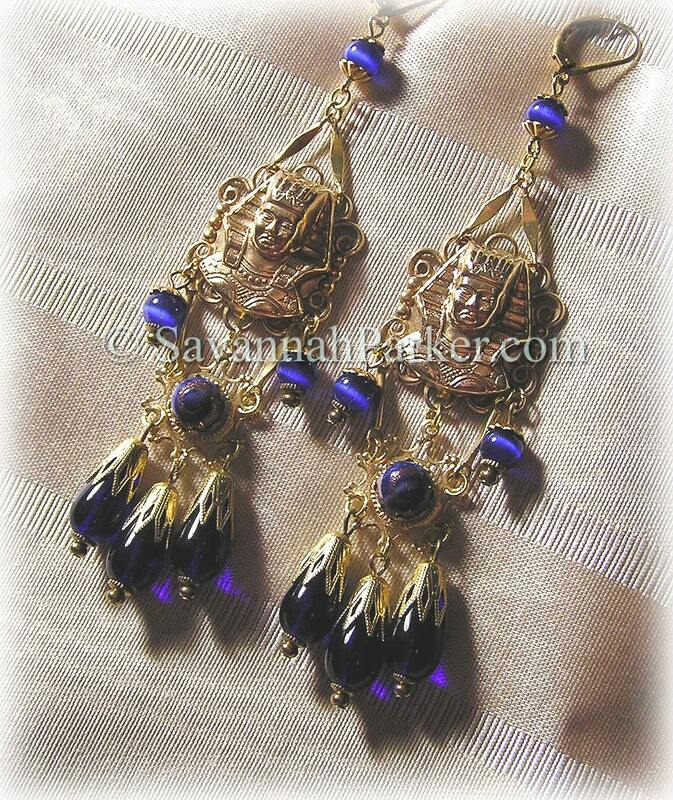 The basis of the design for these are very beautiful vintage brass filigree findings including some extraordinary vintage brass miniature King Tutankhamen masks--genuine pristine old stock from the 1920's, which I have elaborated on by adding vintage brass filigree backgrounds, fab vintage blue art glass cabochons (deep blue with little swirls of glittering gold running through) and exquisite solid brass and filigree dangling teardrops and connectors of rich deep blue glass. 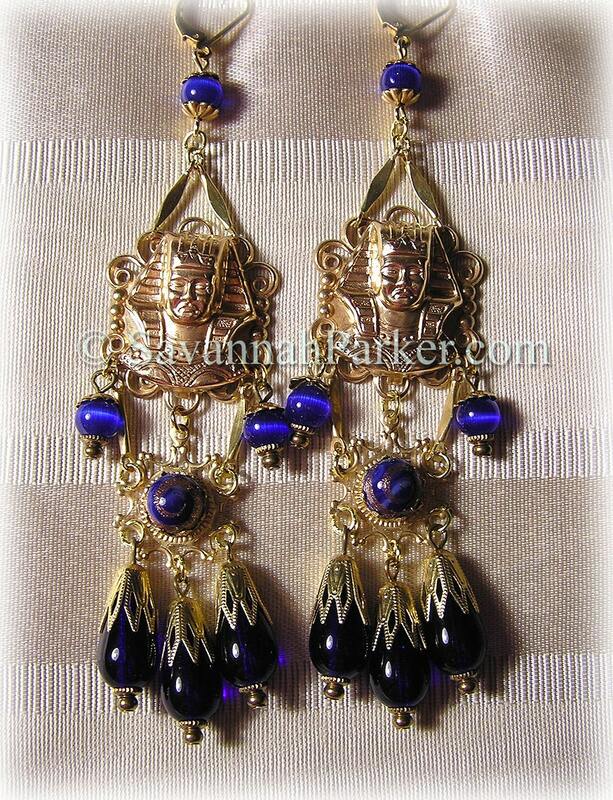 Very beautiful, rich 1920's Egyptian Deco sense to this exquisite pair--they do look like ancient burnished real gold---Earrings are 3 and 3/4" from the top to bottom of each pendant....LONG and gorgeous but not heavy, as the Tut masks are hollow and these are suprisingly easy on the ear though they look quite substantial. These have quality leverback earwires for pierced ears.....I never use the cheaper "fishook" type wires! The stones & findings I use in my jewelry are all wonderfully unique, and come from my ever-growing stock of fine unusual and vintage beauties---am always searching for gorgeous old elements to recreate that fabulous old antique look....Very comfortable & substantial on, and I always "test run" my jewelry to make sure it's very durable and sturdy....this one is a great addition to any vintage and antique lover's costume jewelry collection! Please check my other listings for more handmade, truly antique-in-essence jewelry, 1920s style flapper cloche hats, gorgeous handmade vintage lace clothing and other great items....I will be adding many more exquisite pieces including clothing, more hats and more accessories so do come again soon and thanks for looking!